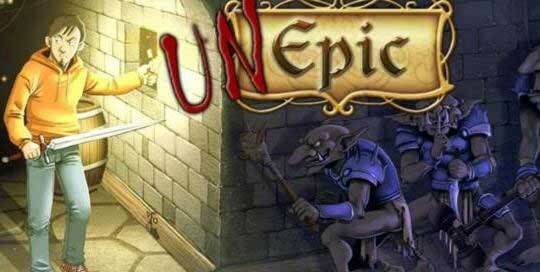 Unepic is a mixture of platform game, role game and joke that takes place in a huge castle of medieval fantasy. It is set in the eighty's style, but completed with the most actual features. The hero is called Daniel, a normal guy from today: great videogame player, big lover of sci-fi movies and novice player of role games. In the middle of a role game with his friends, he is teleported to a castle and he thinks that he is having a massive hallucination. So he decides to run his own adventure until the hallucination ends. In the castle, he will be possessed by a shadow, however this shadow cannot control him (being able only talk). The only way of the shadow to escape from the Hero’s body is by the death of the Hero, so the shadow will lie all the time giving false clues always looking for the Daniel’s death.